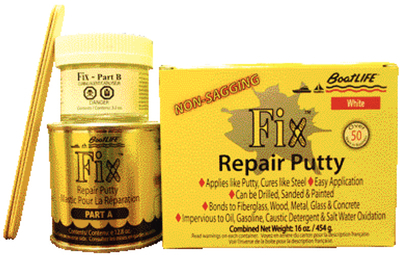 A non-sagging repair putty that cures like steel. Cures completely after 24 hours and can even be used underwater. Once cured, it can be drilled, tapped, sanded and painted. It bonds to fiberglass, wood, metal, glass and concrete and is impervious to oil, gasoline, alcohol, caustic detergent and salt water oxidation. easy clean up with soap and water.